Generally speaking, the various large numbers bandied about on TV spec sheets should be taken with a handful of salt. But there is one quoted by Sony's eye-catchingly white KDL-40WE5 that we just can't ignore – a power consumption of just 97W while it's in use. This figure is lower than those claimed by most 32in – and even some 26in – TVs and more than 50 per cent lower than the manufacturer's own 40W4500 40-incher. The main reason for this power saving is newly developed backlight technology, which uses Hot Cathode Fluorescent lamps (HCFLs), rather than the usual CCFLs. Another key green innovation is the Presence Sensor. This uses body heat and motion to assess if anyone is in the room, turning the TV's picture off and leaving just the sound running if it detects the room is empty. When it detects you have re-entered the room, the picture comes back on. During our tests, the TV achieved a near-100 per cent hit rate at spotting our absence from the room. It did occasionally take longer than we liked to notice our re-entry into the room, but overall we definitely found the Presence Sensor feature to be a worthwhile addition. 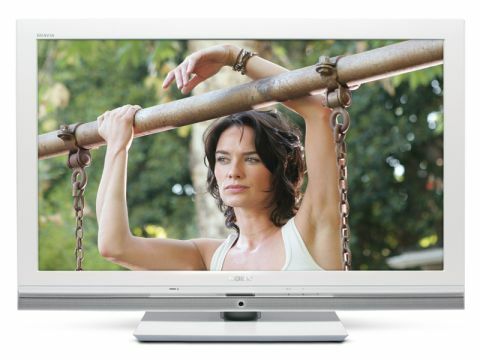 Although the HCFL backlight and sensor are easily the KDL-40WE5's most innovative green features, it also sports a manual 'full off' switch, while a dedicated Eco section in the onscreen menus includes a PC Power management system that turns the TV off if no PC signal is received and a light sensor mode that lowers brightness in response to reductions in your room's ambient light level. One final tree-hugging touch sees the instruction manual built into the onscreen menus, rather than printed on paper. Elsewhere, the KDL-40WE5 includes four HDMIs, a USB port that can play video, photos or music, an ethernet port allowing communication with either a DLNA-certified PC or Sony's online Applicast service; 100Hz processing; and Sony's robust Bravia Engine 3 video system. The Applicast online service is currently a rather limited affair, offering little more of interest than RSS news-feed subscriptions, a few downloadable images to use as screensavers, and a world clock – hardly up there with the YouTube, Flickr and Yahoo Widget systems available on Samsung's internet-enabled TVs. We'd expected the KDL-40WE5's green features to entail performance compromises. But in fact, its pictures are arguably the best yet from a Sony LCD. The set's superb black level response is particularly striking, leaving dark scenes looking natural, dynamic and credible in a way seldom seen outside the LED/plasma worlds. What's more, there's practically no trace of the backlight inconsistencies seen on numerous other Sony TVs recently. Also surprising, given the low running power, is the richness and vibrancy of its colour palette. Less surprising, given the heritage of Sony's Bravia Engine, is how stunningly clean and sharp images look with both standard and high-definition images. The 100Hz engine does well at reducing motion blur and judder, too. With the KDL-40WE5's excellent pictures being joined by some suitably powerful and clean audio, the only negative thing to say about this terrific 40in eco warrior is that its colours and contrast drop off if you watch from a wide angle. Otherwise, it's all good. Very, very good.